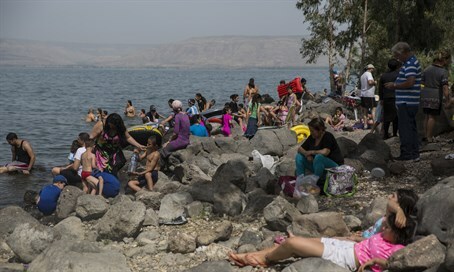 Half a million tourists visit Kinneret beaches, authorities prepare large-scale cleaning operations ahead of holiday weekend. The Kinneret Authority reported that since the beginning of the Passover holiday, approximately 500,000 tourists visited the beaches of the Kinneret (Sea of Galilee). With that, nearly 300 tons of garbage was collected in total from the shores. The Kinneret Drainage Authority, which is responsible for most of the beaches around the lake, helped run a large-scale cleaning operation on Wednesday ahead of the last days of Passover and Mimouna, a traditional Moroccan Jewish celebration held the day after Passover marking the return to eating bread. About 100 tons of garbage were collected and according to reports, there was a considerable improvement on the beaches compared to previous years given that the majority of trash was collected from bins.